After submitting p-card transactions, there are a few different ways to check on status. 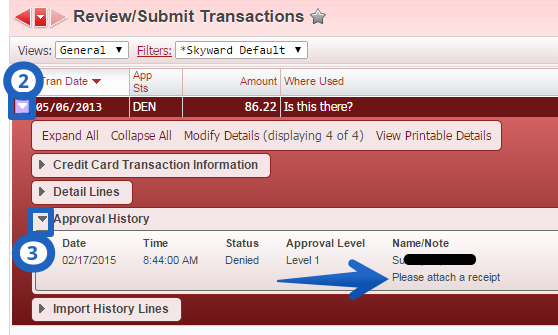 The important thing to remember is the status code: WFH = Waitng for Approval, APP = Approved, & DEN = Denied. Card holders need to take action if the App Sts is blank or DEN. Click Accounts Payable from the Finanacial Management system. Click Review/Submit Transactions under the Credit Cards heading. The App Stsis where the status of the transation can be found. Click the arrow to the left of the transaction. Click Account Management from the Financial Management system. Set the account in the bar at the top. Click Credit Card from the left-side menu. Select a transaction from the list of transactions. The App Sts is where the status of the transation can be found.